Part I was a general overview of our vacation, how we planned, and what traveling with two kids taught us. Spoiler alert - we learned a LOT. This part is about our favorite things Disney offers families to make their experience easier and more fun. I like easy and fun. 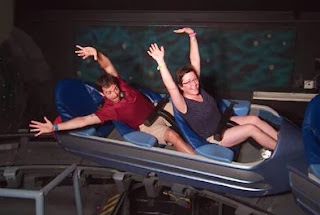 The number one thing I love about Disney is that it is truly flexible and family friendly. Everything about the experience can accommodate a honeymooning couple, a group of friends, or a huge family reunion all the same. The rides, shows, FastPasses, transportation, dining - everything. 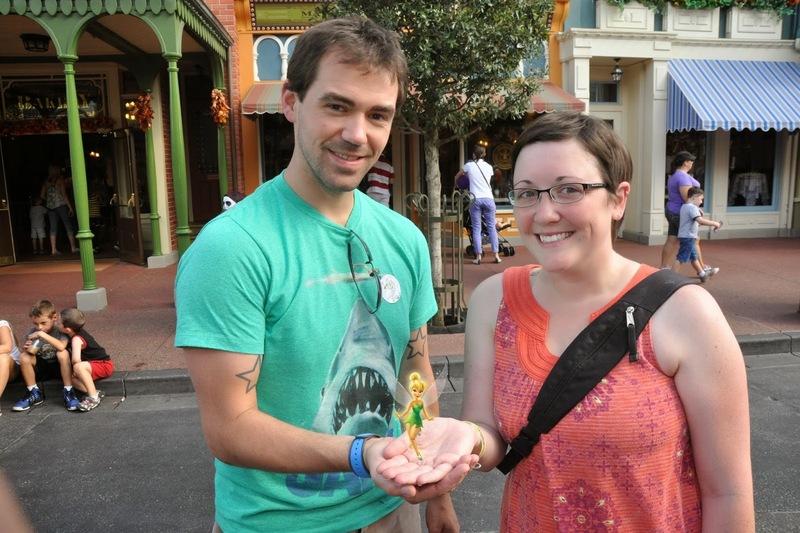 Here are our favorite Disney things and park tips. Disney never has just a ride and you never just stand in line. You play games, watch videos, and if you're waiting for Dumbo, you get an entire play place to wait in. They sure do know their target audience - sugared up, overtired kids (and adults) who can't stand in line for very long! 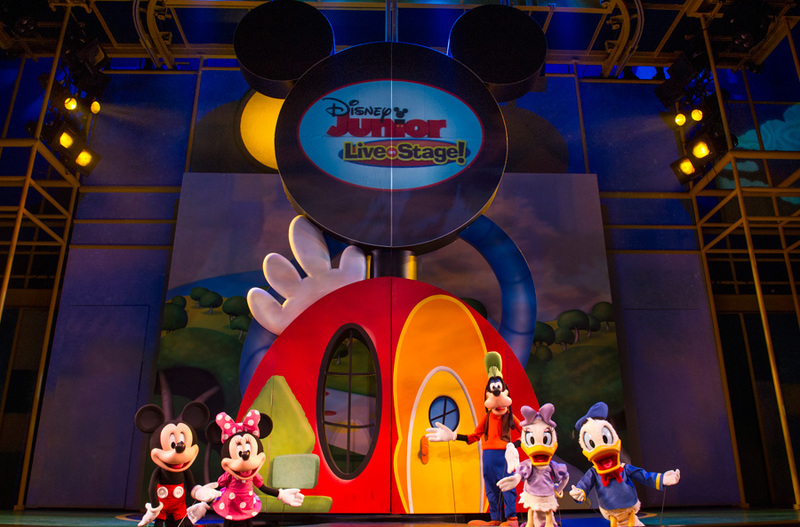 Disney Jr. Live on Stage was a must for us - Charlie is obsessed! The show was wonderful, but make sure you get a seat in the middle - too close to the stage and you can't see anything. Mickey's PhilharMagic and Muppet Vision 3D both required glasses, which Charlie refused to wear, but he still enjoyed the show. We went to Monsters Inc. Laugh Floor on a whim and it was great! At first, I thought it was a canned show that you just watch, but its a live, interactive show with some pretty hilarious family friendly jokes. As you can see, most of the family rides are in the Magic Kingdom, while most of the thrill rides are in other parks. Keeping everyone happy makes for some park hopping, but that's why the park hopper passes are so important! Our resort was part of a test group for the new MagicBand system. It will be rolling out to everyone sometime in the next few months, but until then it was kind of neat to be part of the testing! The MagicBands were AWESOME! We customized ours before we arrived. We were able to choose from seven colors and have our name put on the inside. They were comfortable, cute, and ridiculously convenient. 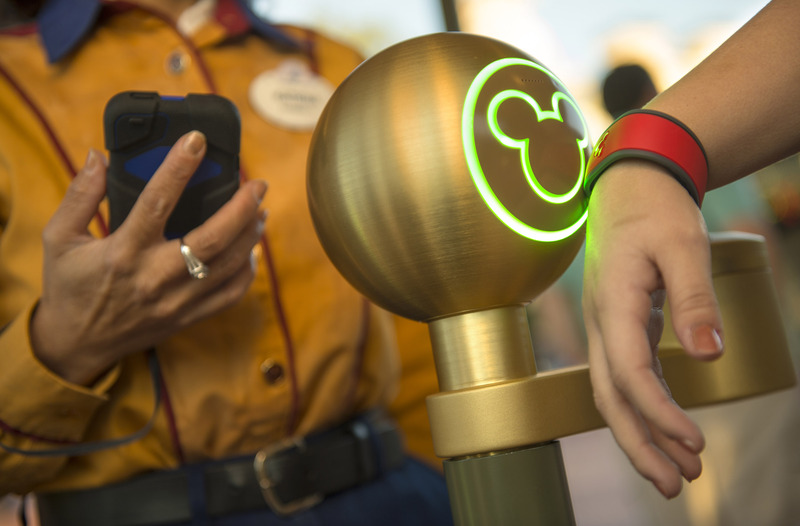 Equipped with a short range RF reader, your band is loaded with your park tickets, resort information, room key, dining plan, PhotoPass+, FastPass+, and after hours party tickets. It is linked to your credit card allowing you to make purchases around the park with a PIN instead of carrying your wallet. They are also waterproof, so bringing them to the water park isn't a problem. Though they cause a bit of a tan line, the MagicBands were a huge hit with the whole family. Even Charlie wore his! You can get a bottle of water as your drink using quick service meals. Much easier to tote around the park. Kids under 2 eat free at buffets and are allowed to eat off your plate at all other restaurants. If you want to order a kid meal, however, you can. They're very well priced considering its a theme park. A main dish, two sides, a drink, and a dessert cost us about $6 quick service and $8-10 sit down. You can make reservations for your sit down meals up to 180 days in advance and do not need a vacation booked to do it! So once you know your vacation dates, reserve your meals! When booking reservations, consider restaurants at other resorts. They're open for all Disney guests and widen the variety of places you can eat. Our favorite restaurants were: The Tusker House (AK), Teppan Edo (Epcot), The Biergarten (Epcot), and Hollywood and Vine (HS). Here is a site that can help you maximize your dining plan snack credit! You know those photographers that stand on Main Street and a bunch of other spots around the park? Buying those pictures after you get home can be very expensive ($15 a download! ), but with the PhotoPass+, you can get unlimited park pictures, magic shots, ride photos, and character dining pictures. A bonus - if you buy the pass before you leave, you save $50! For $150, I didn't need to worry about handing my camera to a stranger, missing shots, or not being in any pictures. We have a DVD of 140 pictures coming to us in the mail. I can't wait to share them! Wear sneakers! You'd think this was a given, but its not. You'd be shocked at how many people were wearing flip flops or worse - sandals with heels. The first aid station is wonderful. It is staffed by RNs and they stock medication and supplies. We forgot a syringe for Charlie's meds and they had one for us! Now that's customer service. Quick Service food stands will give you big cups of ice water for free. If you use the MagicBand FastPass+, still bring your Key to the World cards with you to the park. You can still use them to get FastPasses at the machines. If you buy something at a gift shop (especially something breakable), they can send it to your resort free of charge. There are mailboxes all over the parks and at your resort so you can send post cards home. Ask photographers if they do magic shots. If they do, they'll take one for you, but they won't offer it up front. You can bring food and drinks into the park, with the exception of glass and alcohol. We brought water bottles, baby food, and snacks to tide us over between meals, but you could easily do packed lunches if you're on a budget. If you have little ones, you can get a pack and play or a toddler bed rail for your resort room. Please don't suddenly stop in the middle of a busy walk way. You're gonna get run over. Don't let kids operate your motor scooter - they will run into other guests. At parades, fireworks, and shows, please look behind you to make sure you're not blocking a child's view. Don't get upset if a child is crying on the bus, in a restaurant, or while waiting for a ride. You are at Disney World. If the presence of children surprises or upsets you, go somewhere else!